(Nanowerk News) Iron nanoparticles injected before magnetic resonance imaging can make tissues more visible and the same nanoparticles may allow doctors to precisely target tumors with new medicines. However, among the challenges to the practical use of nanoparticles in the human body is what scientists refer to as lack of "hemocompatibility" - nanoparticles tend to be attacked and cleared by the immune system, negating their usefulness and also potentially causing side effects including shock and loss of blood pressure. 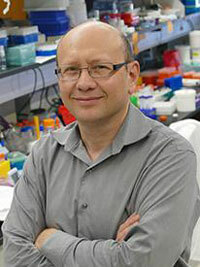 A University of Colorado Cancer Center study recently published in the journal ACS Nano ("Modulatory Role of Surface Coating of Superparamagnetic Iron Oxide Nanoworms in Complement Opsonization and Leukocyte Uptake") describes an important mechanism the immune system uses to target iron nanoparticles and brings researchers a step closer to helping nanoparticles evade this activation. Dmitri Simberg "Basically, we tried to understand how the immune system recognizes nanoparticles," says Dmitri Simberg, PhD, investigator at the CU Cancer Center and assistant professor in the Skaggs School of Pharmacy and Pharmaceutical Sciences, the paper's senior author. Simberg and colleagues started by injecting a version of sugar polymer dextran coated iron nanoparticles known as superparamagnetic nanoworms into mice. As expected, the mouse immune system attacked the nanoparticles, as evidenced by "uptake" by many immune cells including lymphocytes, neutrophils and monocytes. "However, we didn't see this same immune cell uptake in mice with a very specific deficiency," Simberg says. One category of mice tested had been engineered to be incapable of manufacturing proteins essential to the "complement system" - one of the immune system's mechanisms for recognizing pathogens in blood. Like slapping a post-it note on an enemy's back, the body uses these 30-or-so proteins to tag pathogens and foreign materials for destruction by the immune system. "Mice without complement proteins did not attack and clear nanoparticles," Simberg says. In these complement-deficient mice, superparamagnetic dextran iron oxide nanoworms escaped the immune system and were able to function as desired, magnetically labeling cells in a way that would aid MRI imaging. "In addition to mice, human leukocytes with disabled complement systems did not uptake iron nanoparticles," Simberg says. Human blood cells donated both by healthy participants and by cancer patients efficiently ingested nanoparticles; when the blood was treated with a drug that inhibits the complement system, the immune cells did not attack the nanoparticles. Unfortunately, the solution to the practical difficulties of nanoparticle use is not to block the human immune system's ability to recruit the complement system, which is an essential tool in the body's fight against infection and disease. ("That would be bad," says Simberg.) Instead, Simberg and colleagues continued the line of study in search of ways to engineer nanoparticles to evade this system. There are three pathways that activate the complement system: Lectin, classical and alternative. The lectin pathway recognizes specific configurations of sugar molecules common on the surfaces of harmful microorganisms including salmonella and listeria. The "dextran" in superparamagnetic dextran iron oxide nanoworms is a sugar that is recognized by the lectin pathway, activating the complement system and resulting in the immune system attacking these particles. However, Simberg and colleagues showed that by inducing crosslinks between sugar molecules coating these nanoparticles, the structure was enough altered to become invisible to this lectin pathway. "When we used a chemical to create crosslinks on nanoparticle surfaces, we saw that they were nearly invisible to mouse immune systems," Simberg says. This crosslinking reduced the immune system uptake of nanoparticles by more than 70 percent. However (to the researchers' surprise), the technique did not help nanoparticles evade the human immune system. "It turned out that while mice use mostly the lectin pathway to activate the complement system to attack nanoworms, in humans the most active pathway that attacks nanoworms is the alternative pathway. This alternative pathway is not tricked by crosslinking and so the human complement system continues to recognize and attack crosslinked nanoparticles," Simberg says. However, the picture is even more complex than that: Despite complement activation, crosslinking nanoparticle surface sugars still enabled the nanoparticles to partially evade human immune cells. If not complement system evasion, what is it about these crosslinks that helped nanoparticles escape? "We have a paper in process on exactly this," Simberg says. "We hope to submit for publication in a few months."